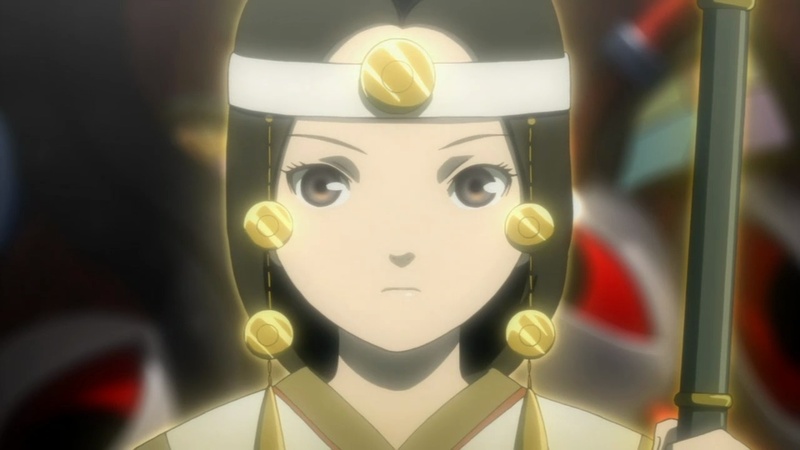 The 24th and final episode of Shangri-la, “Ideal Homeland”, begins from the end of the previous episode where Kuniko crashes into Ryouko’s fun. Instead of going splat on the floor after dropping from the ceiling, Kuniko uses the dagger to cause a wind that cushions her fall: she seems to have an innate understanding of the mystical powers of the dagger that she might not be aware of. Being who she is, Ryouko cannot just let Mikuni continue pulling out the heavenly spear and tries to force Kuniko to pull it out instead by taking her sister hostage. Yes, Mikuni is indeed Kuniko’s sister. This was merely a suspicion before, but now Ryouko has confirmed it. As most of us would have suspected, Mikuni and Kuniko were both created artificially. Mikuni was created from the genetic combination of those that descended from Himiko, while Kuniko is a direct clone of Himiko herself. Technically, this would make Kuniko more like a great-aunt to Mikuni than a sister, but whatever. The earrings of Mikuni and Momoko must have been found on the mummified Himiko, the being that would be considered the mother of Kuniko and Mikuni. In the upper layers of ATLAS, Nagiko and Tarsian are explaining the same thing to the others. It also explains what Digma-0 was a prototype for. However, I was rather surprised upon learning the origins of Kunihito: unlike the other Digma, he is completely normal. He was designated Digma-3 because he is a descendant of Himiko. Haruko knew, but Nagiko had made her promise to keep it secret. By now, Nagiko and Tarsian have also figured out what Ryouko wants: her body has a limited shelf life, so she intends to possess either Mikuni or Kuniko. Some sort of explosion then causes a power outage in ATLAS. 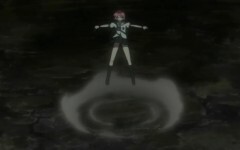 It was caused by Takehiko, who is using weak explosions to provoke much more devastating attacks by the Daedalus on the eighth layer against the central shaft of ATLAS, the same trick used by Kunihito in episode 18. 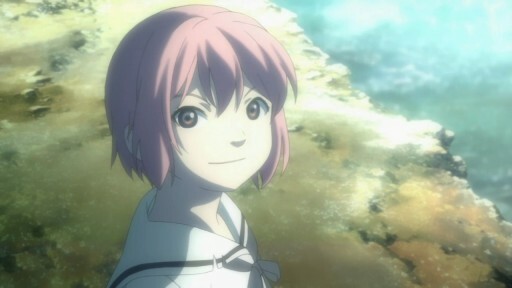 Hata, who had been imprisoned in a cell by Shougo, uses this chance to escape before the backup generators come online. Shougo has a monitor on Hata’s cell so that he knows that Hata has escaped, but Hata has his own view of the ATLAS control center through which he learns where the attacks against ATLAS are occurring. Back in the zeroth layer, Kuniko has not acquiesced to Ryouko’s demand that she pull out the Ama-no-nuboko, the heavenly spear, so Ryouko strengthens the pot with the fate of the world. Medusa has completely gained control of the military networks, and with Zeus being the only thing capable of stopping the nuclear holocaust, Kuniko is forced to pull out the Ama-no-nuboko. With the flashy pullout, Ryouko is quite happy, but she has no intention of stopping the destruction of the world with the excuse that it is too late. Medusa has initiated the launch of nuclear missiles all over the world, and those in the ATLAS control center can only watch as the monitors show cities all over the world being destroyed. Medusa is quite satisfied that enough soot has been injected into the atmosphere to cause a nuclear winter. This causes a measurable drop in temperature which would lower sea levels, so Medusa feels like taking the liberating step of opening the flood gates for the Marshall Islands. However, Medusa is totally surprised by the waters engulfing him. It turns out that Karin had hacked things so that the nuclear holocaust only occurred virtually. Perceiving things only online, Medusa did not have a clue that no nuclear attacks were actually occurring in the real world, nor did it realize that temperatures nor sea levels would not drop so quickly. This indicates that the hardware for Medusa is located in the Marshall Islands and would be destroyed if engulfed in water. This would motivate Medusa to manipulate the carbon markets that determine the sea levels out of survival instincts. It would also explain its continual pleas for help as the hardware would have been placed precariously so that a significant rise in sea level would drown it. Karin watches on dejectedly while Medusa drowns, her life work going down the drain and any hope for seeing her parents again gone. Ryouko is pissed at what Karin did, but she still got what she wanted with Kuniko pulling out the Ama-no-nuboko. After the flashy stuff ends, Kuniko turns around and announces herself to be Himiko, which makes Ryouko really happy about her imminent possession of a new body. But Kuniko was only acting and teases Ryouko about it, breaking the Ama-no-nuboko in half. There is no explanation of why Kuniko could have fought off possession by Himiko (or why Himiko would possess her in the first place), but that is fine with me: I find this to be such a moment of cool that the lack of explanation doesn’t bother me. However, the moment of cool totally enrages Ryouko, whose first act is to shoot Mikuni. 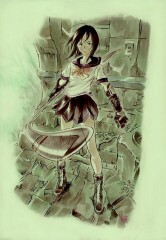 So imagine her surprise when an ethereal Miko suddenly appears and deflects the bullets. There is no time to reflect on what just happened as Kuniko attacks, who exercises her full superhuman prowess hinted at since episode 1. Pulling out the Ama-no-nuboko may have also awakened something within her. This time, Ryouko is no match against the direct clone of Himiko and is soon impaled with the blade of the Ama-no-nuboko. Before dying, Ryouko can’t help but say that Japan will die out without ATLAS, but Kuniko isn’t the sort to give up without a fight. And Ryouko shrivels into an old hag and dies. Things are not over yet, however, as Zeus forcefully shuts all the gates of ATLAS to prevent escape and tries to use the life energy collected by Ryouko to revive Himiko. The Ama-no-nuboko also shakes in Kuniko’s hand as it tries to return to its owner. But remember how Sayoko fell in the previous episode? I had first thought that there would be no way she could survive from the second drop, but changed my mind after hearing that they were almost at the zeroth layer, since she could have fallen from a survivable distance. And indeed Sayoko shows up, albeit with a broken arm and who knows what other injuries, which lets Kuniko leave Mikuni to Sayoko with herself flying up as she is pulled by the Ama-no-nuboko. Reaching the core of Zeus, Kuniko finds herself facing someone who looks just like her holding an undamaged Ama-no-nuboko. It is a projection of Himiko, who states that she and Kuniko are one and the same, even interchanging names. She also states that the humans who have obstructed her purpose must be punished. She intends to use ATLAS to open the qi flows, circulate the energies of the earth, and revive herself, where the ten million residents of ATLAS will be sacrificed in the process. Of course, Kuniko is not going to let that happen. Himiko is obviously not the source of Ryouko’s personality, but she is as much in disdain of humanity. At the eighth layer of ATLAS, Takehiko is watching the Daedalus attack the central shaft that would eventually result with the collapse of ATLAS, which is when Hata shows up. Hata is fanatical about ATLAS being the future for humanity, not really caring if it is Ryouko or someone else he has to serve as long as it meant serving ATLAS. Referring to Takehiko as Number 13 (the same title being mentioned in episode 16), Hata intends to shoot him as a threat to ATLAS, and Takehiko let’s it happen without a fight. Takehiko gets the last laugh, though, as he knew the Daedalus would react to the heat of the gunshots and kill Hata. Back near the core of Zeus, Kuniko must fight against Himiko, who cheats by invoking multiple projections of herself. These projections can inflict real physical damage, but the real Himiko is yet to revive and still resides within Zeus. Kuniko seems to have realized this and destroys Zeus itself during a difficult battle, which dispels all the projections after Himiko finally realizes her demise. Only the broken Ama-no-nuboko is left, which itself disintegrates soon enough. And things are finally over. In the zeroth layer, Mikuni is very happy when a ghostly Miko shows up along with the spirits of many other children. This includes Hiruko, who actually seems to be calm and sane now. Miko has to go lead the children to wherever spirits go, to which Mikuni raises a tantrum, but Sayoko slaps her like a real mother should for being so bratty. Before leaving, Miko gives Mikuni a last hug which turns Mikuni’s eyes brown, after which Miko leaves Mikuni to Sayoko’s care and departs with the children. Up in the eighth layer, Takehiko also gets to see his sister before he dies. In Akiba, Karin is totally depressed about the loss of her parents and Medusa. This is when Klaris and Zhang speak up, which is odd since the computers are turned off. In fact, they had showed up in person, having arrived via jet to help out with the aftermath. (Karin’s lackeys are also hanging in the background: living in Akiba, they would presumably be otakus, so of course they would still hang around the epic loli despite no longer being employees.) Karin is very glad for the presence of Zhang and Klaris. They sadly take a look at the last remnant of Medusa, its processor, but Karin sheds tears of joy as a new Medusa is born, and they vow not to repeat the mistakes of the past. As for said niece and sister, Mikuni and Sayoko walk up to where Kuniko, Kunihito, and Momoko are standing in the sun. This was made possible only because Mikuni is no longer dangerously vulnerable to the sun: Miko had taken away her disease along with her power to detect and destroy liars (remember how Mikuni’s eyes turned brown?). Mikuni shows her potential to become a loli rivaling Karin as she shyly asks whether she can call Kuniko her sister, who obviously has no problem at all with it. And Shangri-la ends on a hopeful note, with Kuniko ready to lead the effort to make living space, the first problem among a ton of things to do. By itself, I found this episode to be a satisfying conclusion, with climactic battles that did not drag out pointlessly and an aftermath that ended on a hopeful note. But as a conclusion to the entire show, I found it somewhat lackluster. This is because some huge questions central to Shangri-la have been left unanswered. The chief among them are about ATLAS itself. The original plan was to create living space impervious to disasters, but inherent problems forced it to be revised with Zeus, Hiruko, sacrifices, the whole shebang. What did Nagiko and Tarsian originally expect from the revised plan? What is the whole deal about the heirs? Did they expect the heir to be possessed by Himiko, who would then protect humanity in some unspecified manner? (Although Himiko didn’t seem to be the type to do so …) What would this unspecified manner have been? What are the origins of Himiko and the heavenly spear? 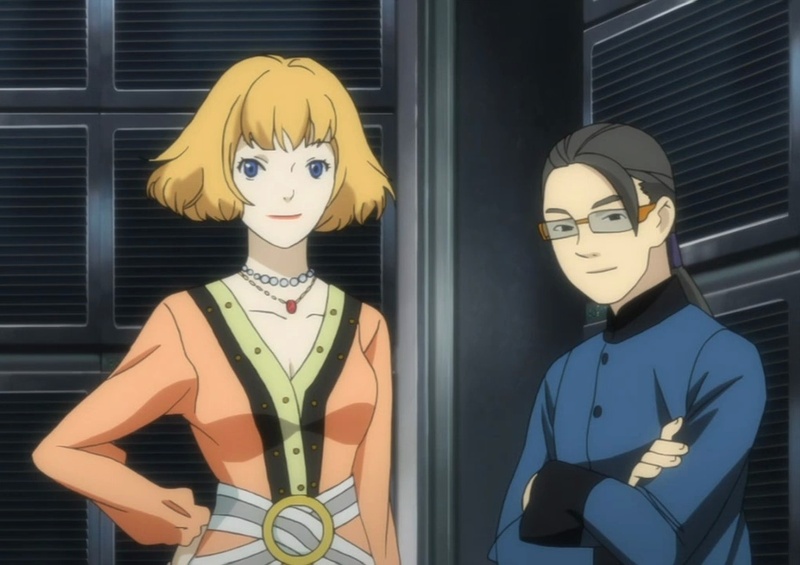 It is also made to sound like the carbon economy was intimately tied to ATLAS somehow, which would explain Kuniko’s intimate sense of the carbon market shown in episode 6 and never shown again. However, I don’t see how they are related at all, besides the fact that ATLAS is a gigantic carbon sink. While mention is made of a new economic system having to be built, nothing happened concerning global warming except for even more carbon dioxide emissions, so the whole motivation for the carbon economy would still apply. And then there is still the mysterious relationship between Karin and Kanaria. After spending the entirety of episode 11 about them, I would have expected more to have come out of this. But the nature of their relationship is never revealed, and episode 11 has ended up only being an excuse for Karin to angst and go out. I can only guess that they are alumni from the same research institute that may have created them, Kanaria as the prototype for two of the Digmas and Karin as a new breed of supersmart humans. I haven’t seen episode 23 and this one yet . . . but I didn’t know that this was the last episode!!! O_O From skimming your summaries, even though some things are revealed, there are still many things that are not clear. But well, I know I’m still going to enjoy these episodes but damn . . . I need to catch up. . . . guuuhh . . . friday or weekends maybe . . .